Boiling water has never being more colourful with the Kalorik Glass Digital Kettle! Combining sleek design and high performance, this kettle is the perfect addition to any kitchen. The multicolour LED illumination adjusts accordingly to preset temperatures. This jug kettle is equipped for fast heating, can boil up to 1.8 litres of water in minutes with just the flip of a switch. With a durable glass body; making coffee, tea, instant cocoa and more is a breeze! The Kalorik Black and Stainless Steel Cordless Jug Kettle makes boiling easier than ever! In a matter of minutes (Faster than the stovetop and the microwave), enjoy your favorite tea, hot chocolate, instant coffee, soup and more. With the auto shut-off function, the kettle will never get dry. The LED blue illumination makes this jug kettle the perfect complement to any kitchen dicor. Boiling water has never been more colourful with the Kalorik Stainless Steel Digital Kettle! Combining sleek design and high performance, this kettle is the perfect addition to any kitchen. The multicolor LED illumination adjusts accordingly to preset temperatures. This powerful, 1500-watt, electric kettle has a concealed heating element that will provide boiling water in a matter of minutes (Faster than the stovetop and the microwave) with just the flip of a switch. With a durable stainless steel body, making coffee, tea, instant cocoa and more is a breeze! 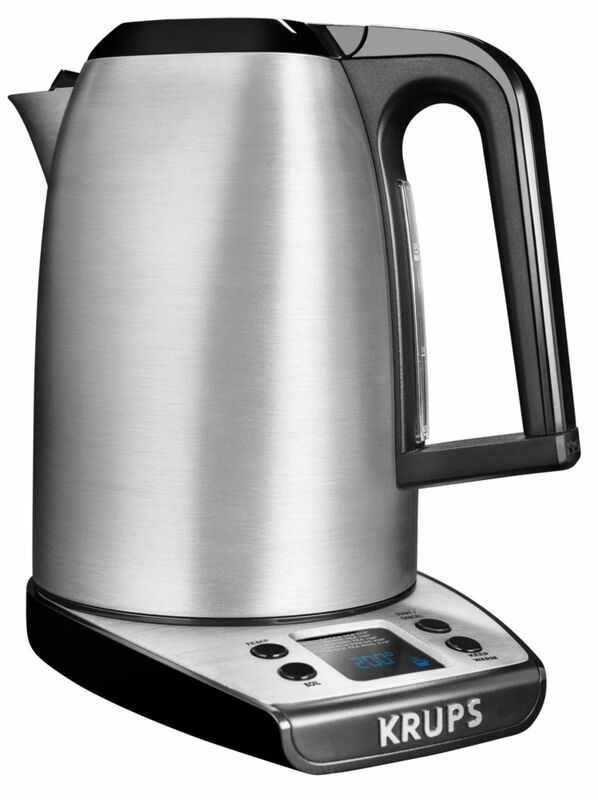 Savoy 7-Temperature Programmable Kettle is rated 4.6 out of 5 by 11. Rated 3 out of 5 by Pascual from This (got it as a gift) is my second kettle Krups and the previous one (modelAC16D1712AMM) was wa... This (got it as a gift) is my second kettle Krups and the previous one (modelAC16D1712AMM) was way better than this one which takes more time to heat and makes noise like a train! Also I don't understand why this electronic feature does not offers the °C degrees (surprising for a kettle made in China). This being said, It's nice to have the choice between different preset temperatures (°F) and this is the only reason I did not return it ! Rated 5 out of 5 by porscherfanatic from Quality product, extremely easy to use, looks great. Quality product, extremely easy to use, looks great. Rated 4 out of 5 by Lana from It works fine. I really like the temperature options. It’s... It works fine. I really like the temperature options. It’s not as fast as I wish it was but it’s ok. Rated 5 out of 5 by Cornbread from Heats up super quick. Wife uses it for her... Heats up super quick. Wife uses it for her hot tea and in her instant oatmeal cups. She loves the keep warm feature that eliminates reboiling the water. Very pleased, would buy again. Price was definitely right and my research showed this was a very highly rated electric pot. We have to agree. Rated 5 out of 5 by David from Bought it as a gift and they absolutely love it.... Bought it as a gift and they absolutely love it. What is the actual model number for this Krups Savoy Kettle? Is it BW314050? As Model # 7211002903 does not show up on Krups website. The model number is BW314050.